Punches have a mechanism which automatically strikes a blow when downward pressure is applied. One-piece point and shank. These punches and nail sets are universally used, but most often by machinists and carpenters. They are well-proportioned for ease of use. The specially selected tool steel is hardened and tempered to the proper hardness. All of them feature nicely knurled finger grips for ease of handling. A special tempering process makes the head less likely to fracture from a hard, off-center blow. ALWAYS WEAR SAFETY GLASSES WHEN USING STRIKING AND STRUCK TOOLS. Rugged automatic punches have all-steel handles and parts. These punches have a mechanism that automatically strikes a blow when downward pressure is applied. No hammer is required, making one hand always free to steady the work. The adjustable knurled cap regulates the force of the blow. Should a heavy mark be required, the cap is screwed down. Progressively lighter marks are obtained by turning the cap upward. The tension of the spring, which regulates the blow is constant, so marks made by the point are uniform in depth and size for each setting. The point can be easily removed for regrinding and/or replacement. All sizes are identical in style, differing only in the striking power. 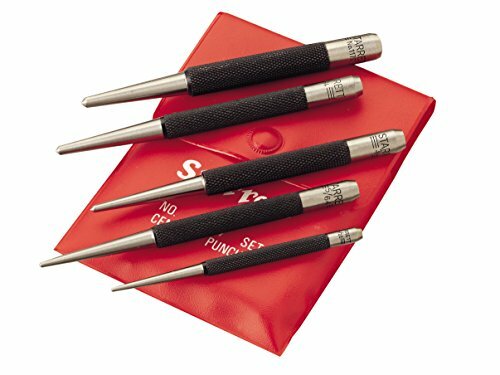 The Starrett 18AA automatic center punch with adjustable stroke is 4" long with a 7/16" (11 mm) diameter for creating a starter dimple without the need for a hammer. The punch has an adjustable stroke, which can be set by turning the knurled cap and is regulated by spring tension for uniform dimple size at every setting. The punch is made from hardened and tempered steel components that provide wear resistance and strength. It has a round handle that is knurled for grip. The point can be removed for replacement or sharpening. Center punches make small dimple marks in a workpiece to help guide a drill bit. Manual center punches have a metal shank with a point and are typically tapped with a ball-peen hammer to mark the material. Automatic center punches have an internal spring mechanism that enables them to mark the material without using a hammer, leaving one hand free for steadying the work. The L.S. Starrett Company manufactures precision measuring tools, metrology and testing equipment, and saw blade products. The company, founded in 1880, is headquartered in Athol, MA. 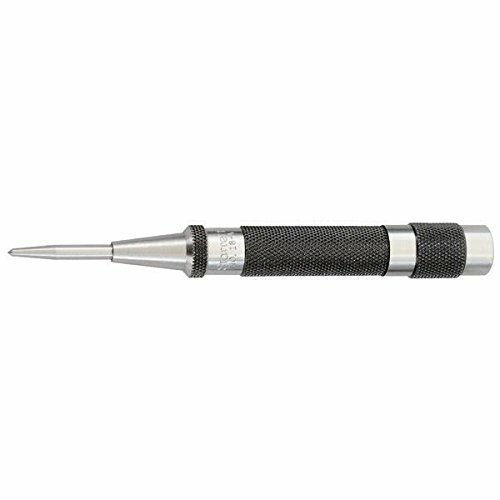 The Starrett 264G center punch is 5" long and has a 7/16" thick square shank with a 1/4" (6 mm) diameter tapered point. 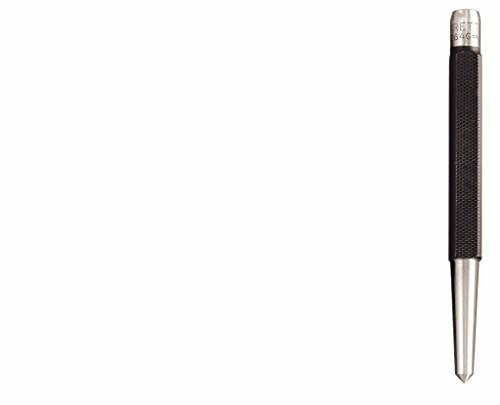 The punch has a tempered steel shank for strength and a hardened steel point for wear resistance. The shank is knurled for grip and has a square shape to prevent it from rolling when placed on a work surface. Center punches make small dimple marks in a workpiece to help guide a drill bit. Manual center punches have a metal shank with a point and are typically tapped with a ball-peen hammer to mark the material. Automatic center punches have an internal spring mechanism that enables them to mark the material without using a hammer, leaving one hand free for steadying the work. The L.S. Starrett Company manufactures precision measuring tools, metrology and testing equipment, and saw blade products. The company, founded in 1880, is headquartered in Athol, MA. Simply engage the beveled edge of the sleeve with the countersunk hole in the hinge and press down on the handle until the built-in mechanism strikes a blow for truly concentric starting holes every time. To draw hinges, etc., sideways, tilt the punch slightly in the opposite direction. This automatic centering punch combines with lightweight aluminum punch with an exclusive self centering locating sleeve that automatically centers starter holes for screws. 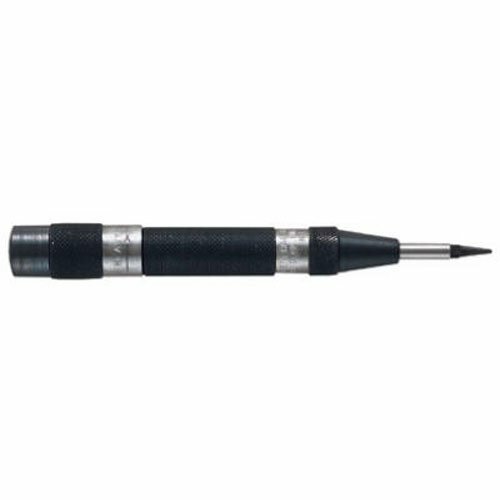 The Starrett 818 automatic center punch with adjustable stroke is 5" long with a 5/8" (16 mm) diameter for creating a starter dimple without the need for a hammer. Internal parts and the punch point are made from hardened tool steel for wear resistance, and the handle is made from 818 aluminum alloy for lighter weight than all-steel punches. The punch has an adjustable stroke, which can be set by turning the knurled cap. It also has a built-in mechanism to center the dimple. The point can be removed for replacement or sharpening. Center punches make small dimple marks in a workpiece to help guide a drill bit. Manual center punches have a metal shank with a point and are typically tapped with a ball-peen hammer to mark the material. Automatic center punches have an internal spring mechanism that enables them to mark the material without using a hammer, leaving one hand free for steadying the work. The L.S. Starrett Company manufactures precision measuring tools, metrology and testing equipment, and saw blade products. The company, founded in 1880, is headquartered in Athol, MA. Punches have a mechanism which automatically strikes a blow when downward pressure is applied. 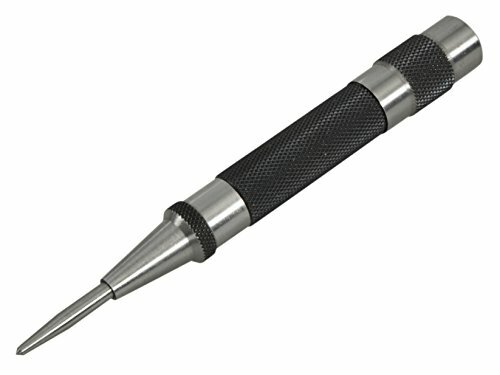 The Starrett 117E center punch with round shank is 5" long and has a 1/4" (6.5 mm) diameter tapered point. The punch is made from hardened and tempered steel, which provides wear resistance and strength. The round shank is knurled for grip. Center punches make small dimple marks in a workpiece to help guide a drill bit. Manual center punches have a metal shank with a point and are typically tapped with a ball-peen hammer to mark the material. Automatic center punches have an internal spring mechanism that enables them to mark the material without using a hammer, leaving one hand free for steadying the work. The L.S. Starrett Company manufactures precision measuring tools, metrology and testing equipment, and saw blade products. The company, founded in 1880, is headquartered in Athol, MA. So - Whats The Deal With Automatic Center Punches?! ?